Resume: Angel is the son of the devil, bleeding Luciano blood. Adalyn wants to be a mob wife. Angel doesn’t want to have anything to do with someone from Caruso blood. Seized by his enemies, he’s only a moment away from death. Toying with the enemy, Adalyn is about to get caught in her own trap while Angel is about to find out some things are stronger than blood. 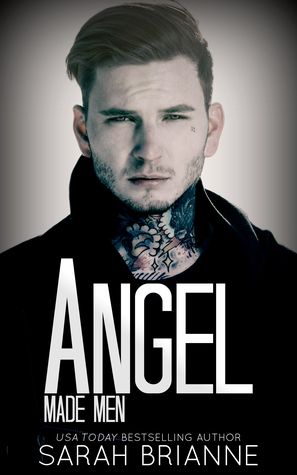 Giving 3 stars because the story could be good and Because Angel is adorable. I do have issues with this book. I liked Nero, I kinda liked Vincent, I started having issues in Lucca (my favorite character) and I was hoping with author would find back the ideas for this series. – Storyline ok but with no big events. A bit boring. I mean, you have Lucca’s family, now you have Lucianos and still.. nothing? Empty story. It was all about a childish girl forcing a romance with a guy. And the author didn’t even explored well Angel when was a kid and his traumas. Him sleeping inside the wardrobe at the end, just felt so out of place. Making him look tough and then that just made it feel like the author was trying to force the broken guy thing. Sorry, but to me it felt random. – The writting… I mean, I know it is supposed to be young characters and funny but the author has been doing it in a childish way. I mean “blabla so we hate him” and “blabla do we like him now?” and other situations when I thought it was 12 year old talking and not 18 year old people. – Lake’s character? Why is she becoming so dumb? Why is she acting like a 12 year old girl with crush in someone because he is pretty and then there is the scene when she passes out because Angel has a twin brother also hot? I mean, what? – Why make Vincent look more dumb than usual? “I’m a made man but let me talk how I’m handsome and handsome and handsome and handome. Oh, and I don’t want Angel for Adalyn not because his family hurt my best friend family but because he is more handsome than me”. Why not make funny scenes without making him look dumb? All I remember is how people keep saying how he isn’t smart. Honestly, is it really needed? Because it isn’t funny at all either. – Why make Amo the bad guy but not even doing it in a right way? – The author seems to be from extremes. Everything is ok, next few pages the character is different. I know people change but finding a good pace for the change is better. – Adalyn was totally a kid. She was supposed to be a brat and I was waiting but all I got was a girl that wanted a bad boy so she falls “in love” for a bad boy. And the feelings appears out of nowhere, she is fine now just a crush and next she is so in love. – Angel is a sweet and I like him BUT where is he a made man? A bad boy? Because the author failed passing the feeling through Lucca and now Angel. – Angel doesn’t seem to love Adalyn. Ok, he starts not liking and not showing feelings, then he may have a crush and kisses her out of nowhere when he still thinks he loves someone else, and next time he still talks how he loves someone else but looks at that person thinking how much he loves her and then.. he loves Adalyn. Sure I have read books like this but again.. Went from indifference to love without much story to actually make him fall in love was so.. ugh. He seems more in love with Bella than Adalyn and we only see Bella once. – Maria.. Maria at this point dosn’t even seem real because of her personality. The author seems to want to make her badass but it seems so forced. – Lucca.. Lucca was supposed to be the bad boy but acts like a kid in things like get upset because Vincent was looking at Chloe with his “pretty” face. Is this the mean and matured character I fell in love? – The series is about mafia and supposed to be darker and I can’t see anything when this book was all about childish characters and actions with forced funny lines and scenes.